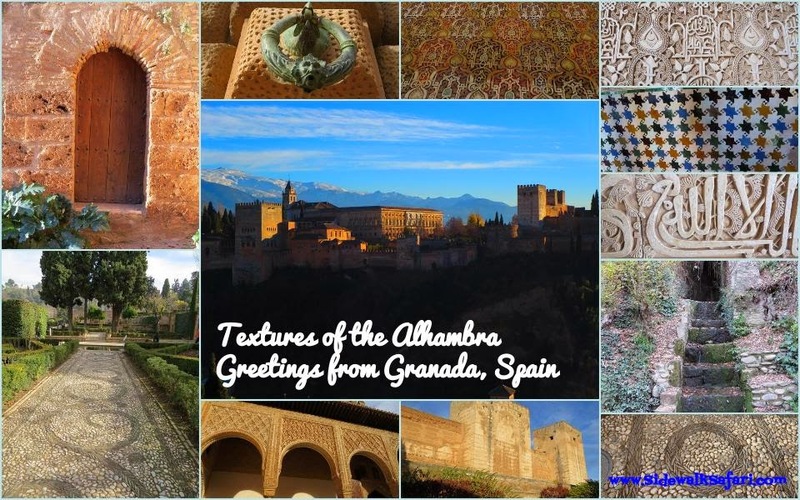 I’m excited to share this guest post from Rob B. whom I met through the Travel South Africa community on Google Plus. Rob is the owner of South Africa Travel Online. When not spending time with his wife and three children, he enjoys the outdoors, cycling and travelling. Happy travels and thanks for sharing your Aerial Safari! Don’t let the best views of the city you’re visiting slip through your fingers! It doesn’t cost anything more to have an aerial safari from the plane on the way to a city you’re flying to anyway. 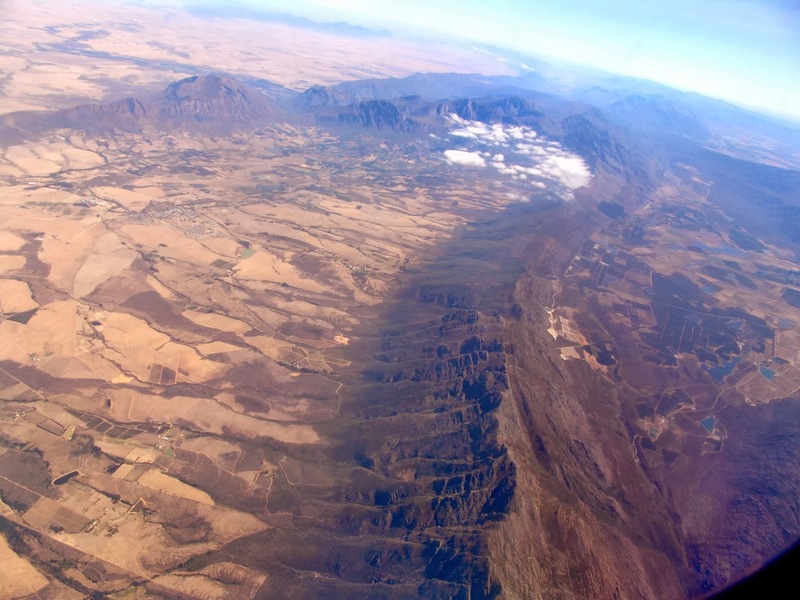 We took a Kulula flight in South Africa from Johannesburg to Cape Town. 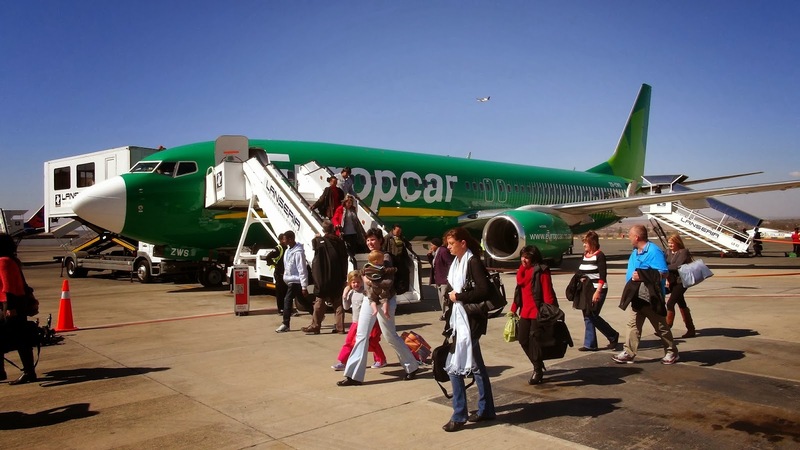 Kulula is one of the two low cost carriers in the country (Mango Airlines is the other one). South Africa also has 4 full service carriers - British Airways, Comair, South African Airways, SA Express and SA Airlink. Our safari began with booking the flight and making sure to get a window seat (without that the safari would be over before it’s started!). A great way of being sure of what you’re getting is to study the aircraft layout on SeatGuru (allows you to avoid rows with misaligned or no windows). We also made a special effort to get on the side of the plane with the best views. Then we needed a bit of luck to have clean windows and good weather. We also did a bit of homework before we flew, so that we’d be able to identify the major landmarks. When flying with little ones there are some challenges, but there is also the joy of sharing in their amazement at these big cigar-shaped metal hulks with wings sticking out landing, taking off and taxiing around the airport. Our son was mesmerised, watching the planes through the window at the boarding gates. 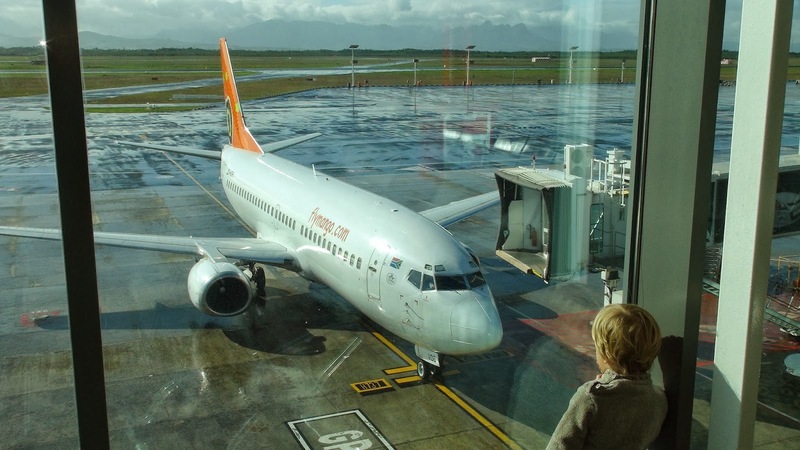 Here’s a photo of him looking at a Mango Airlines plane. It’s not only the destination that counts. Getting there can be half the fun and every bit of the trip can be enjoyed! After a short bus trip it was time to board the plane. 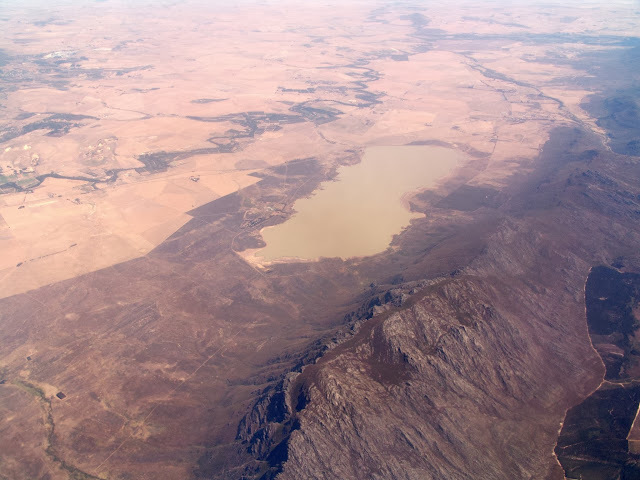 Here’s the Voelvlei Dam, one of several from which Cape Town draws its water, and where non-motorised watersports can be enjoyed. 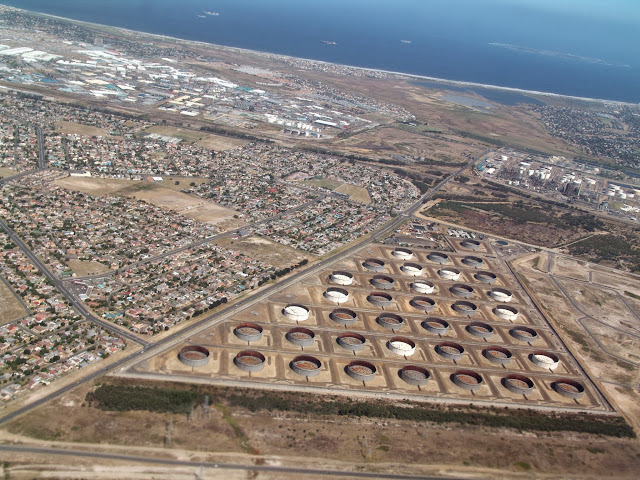 I love being able to get an unvarnished view from up above, seeing also the city’s industry and not just the tourist attractions - here’s the Texaco Oil Refinery near Tableview, Cape Town. Golfers may even see a course they want to play, and then watch the planes from the opposite end down below. 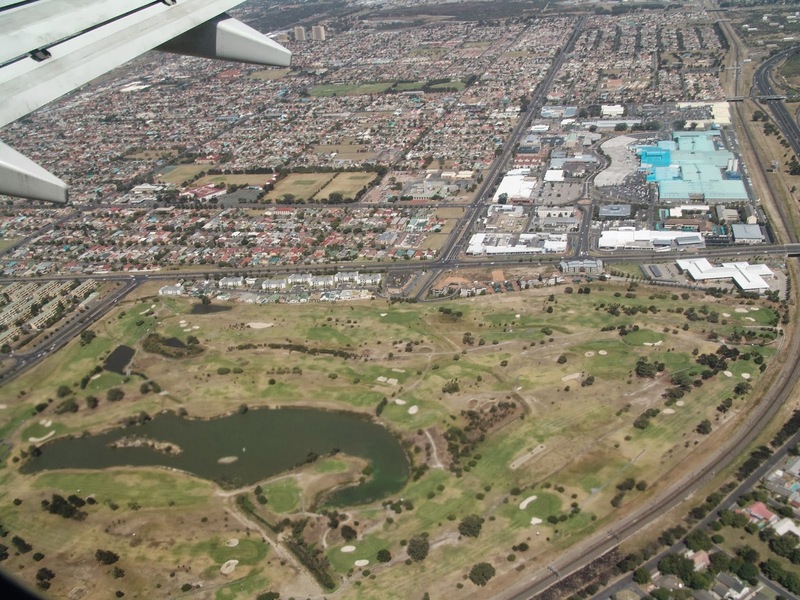 Here’s the Parow Golf Course and the N1 City Shopping Centre in Cape Town. Because of the noise levels of the jets flying overhead, on the final approach to Cape Town International Airport, one passes over the poorer quarters, where tourists seldom go. 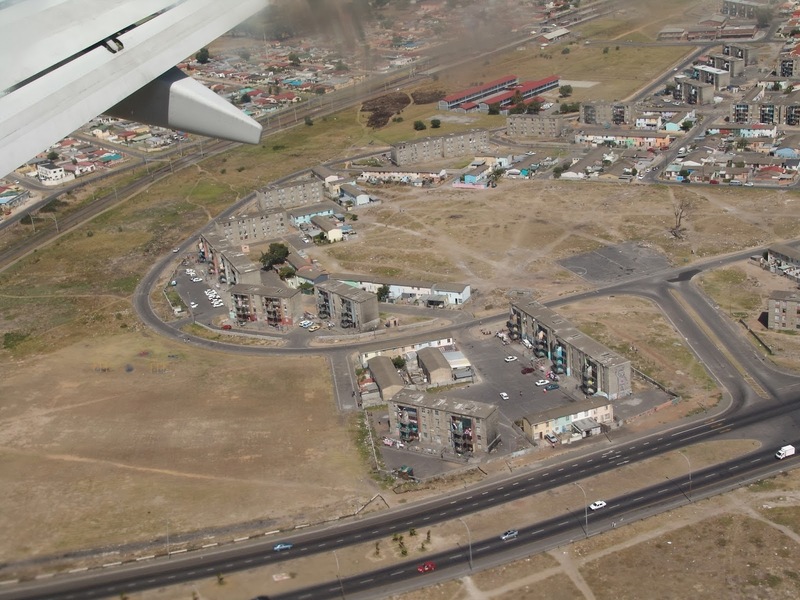 Having enjoyed an aerial safari, it was time to disembark from our Kulula flight, and start the more traditional exploring method, by car and foot. Fellow aerial safarists should be sure to follow the rules regarding electronic devices on planes.